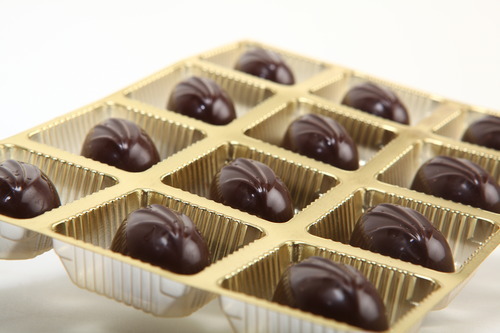 Swisswrap is manufacturer and supplier of Chocolates and Boxes. We are wholesaler and manufacturer of various types of chocolates. Our Chocolates are made in 3 different base- Milk, Dark And White. We offer plain Chocolates for corporate gifting. Chocolate for Corporate Gift offered comes beautifully packed in designer packaging to make the product all the more attractive for giveaways. Here, our expertise lies in taking bulk bookings for corporate gifts as well as providing clients’ customized solutions for bulk orders where they can pick and choose the product they require in the gift hamper. With our rich experience in carefully arranging food and beverages gifts that can be used as gifts for recognizing achievers as well as on other occasions, these beautiful gifts are indeed perfect choice for meeting the corporate expectations. Looking for “Plain Chocolate for Corporate Gift”?